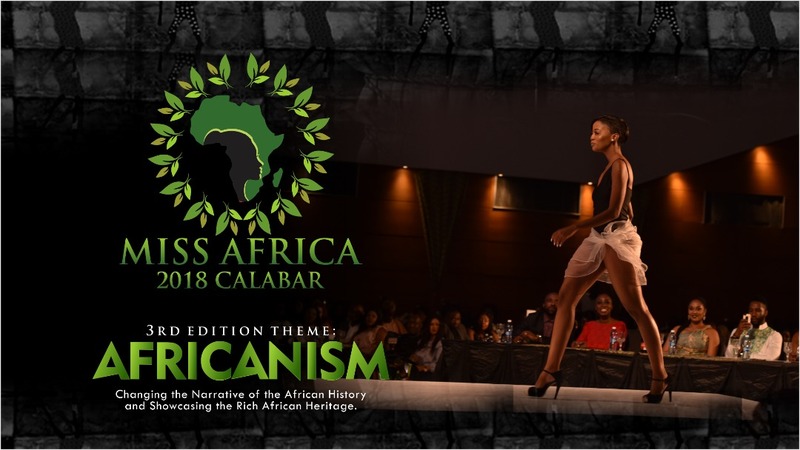 The Miss Africa pageant hosted in the beautiful city of Calabar, Cross River State every December 27th 2018 Eve to Carnival Calabar, Africa’s biggest street party is set to hold its 3rd edition with the theme Africanism. “The Miss Africa Pageant, an initiative of the Cross State Government is created to add value to the annual Christmas Festival/Carnival Calabar. This brand is geared towards promoting the annual theme of the Festival. The 1st and the 2nd Editions were themed around Climate Change in 2016 and Migration in 2017 respectively. The theme was used to promote eco-lifestyle and create awareness for the possible ways to mitigate the negative effects of climate change, making African communities more habitable as against irregular Migration that may lead to desolation of our Motherland. It’s the amalgamation of beauty and brains. The Third Edition is slated for the 27th of December 2018 and will be hosted by His Excellency, the Executive Governor of Cross River State, Prof. Senator Ben Ayade, at the Calabar International Convention Centre, Cross River State, Nigeria. It promises to host over 30 African Beauties and Brains across Africa with the Carnival theme; AFRICANISM, telling the true stories of Africa and Africans, promoting our cultural heritage and investment opportunities with a total prize money of 50,000 USD and a brand new SUV. The contestants would be camped for 2weeks where they will be mentored and drilled and prepare for the grand finale which would crown the third Miss Africa Queen that would lead other contestants in advocating for a greener and sustainable Africa that is habitable, reducing irregular migration, reduce the negative effects of climate change on our motherland by creating awareness on how to reduce, reuse and recycle non degradable waste products, and more importantly, promoting Africa Positively to the world at large. The audition for this year’s pageant kicks off in the month of November starting on the 3rd of November 2018 in Botswana. Next will be South Africa (8th – 9th), Lagos (15th) and Abuja (17th). The auditioning will end in Calabar, Cross River State, Nigeria on the 21st where the list of the final contestants will be unveiled” and voting will commence immediately after. The event which will be aired Live on DSTV Channel 198 and will also have a daily show on YouTube and social media to enable fans follow their favorites and vote to keep them in the show. Hello Africa, this is the Miss Africa takeover, follow us on all our channels for daily updates and stand a chance to win fabulous sweepstakes.